STANFORD (US) — An estimated 100 million people in South Asia have been exposed to groundwater contaminated with naturally occurring arsenic, which is linked to cancer and other health risks. Drilling deeper wells (the “dig deep” strategy) has become common in the search for clean water that is used for drinking, agriculture, and industry—but new research shows that even deep wells might not be arsenic-free. 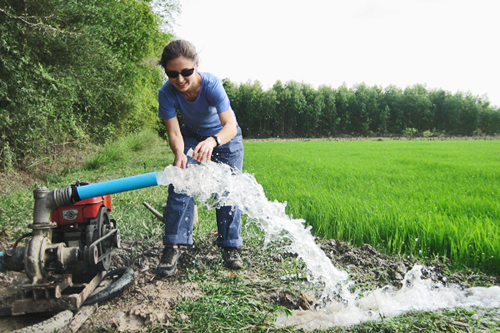 Scientists reviewed 42,000 well measurements taken throughout the multi-aquifer system of Vietnam’s Mekong Delta—the southern tip of Vietnam, and the specific area of study. In an area spanning more than 1,000 square kilometers (386 square miles), arsenic was found in nearly 900 deep wells. “Historically, deep wells often tested arsenic-free,” says Laura Erban, a doctoral student in environmental Earth system science at Stanford University and the lead author of the study. In some cases, the wells were contaminated when deep-pumping projects inadvertently transported shallow arsenic, or other substances that help mobilize arsenic, to greater depths. But in the Mekong Delta, it appears there’s an entirely different, and previously unsuspected, process contaminating deep wells. As reported in the Proceedings of the National Academy of Sciences, when water is heavily pumped from an aquifer, surrounding clay layers compact and water is expelled as the land sinks. If this expelled water contains substances such as arsenic, the groundwater can become contaminated. Land subsidence—the gradual sinking of land due to excessive pumping—is common in delta environments and can be measured. “Buried clays may be analogous to ‘dirty sponges,’ releasing contaminated water when squeezed during pumping,” Erban says. By analyzing satellite radar observations of the area, the group found that the compaction of the clay-rich sediment has caused land subsidence of up to 3 centimeters a year. Pumping-related land subsidence is particularly problematic in this region, much of which lies within 2 meters of sea level and is already subject to annual freshwater and saltwater flooding. “This is the first time that satellite measurements have been used to support the occurrence of deep groundwater contamination,” says Steven Gorelick, professor of environmental Earth system science and co-author and project investigator of the study. Together, the ground-based data, satellite imagery, and groundwater simulation model support the hypothesis that compacting deep clays is the likely cause of contamination. “This work is a beautiful example of the application of physical data and physical reasoning to explain an apparently geochemical phenomenon,” says Professor Charles Harvey of MIT, a pioneer in the study of groundwater arsenic contamination who reviewed the findings. For instance, while it was previously believed that intervening layers of clay protected deep aquifers from shallow arsenic contamination, those same clays might actually pose a threat if heavy pumping causes clays to compact and in turn force arsenic into the deep aquifers. Additionally, deep wells may be compromised more quickly and extensively by contamination that originates at depth, compared with shallow sources.